Cercis canadensis ‘Forest Pansy’ is a member of the Caesalpiniaceae family and can be found on the American Bank. 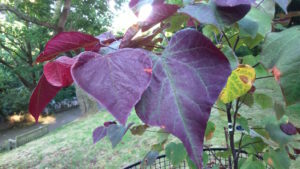 This small tree, a selection given in an AGM in 2002, with heart-shaped leaves of a deep red-purple is a tree for the autumn, as the leaves turn deeper purple before changing to orange as the season progresses. This small tree which will often be multi-stemmed also has clusters of small pink pea like flowers usually before the leaves emerge in spring. It is an easy plant to grow in both sun or part shade, has no particular soil preference and will respond to hard pruning in late winter. 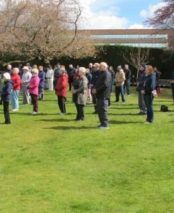 Prune to keep it in the space allocated for it and it will produce bountiful new foliage. It is also fully hardy.